Even if hamburgers are regarded by others as junk food, they still remain everybody’s favorite food. And besides, it is simply not a proven fact. Actually, hamburgers are a good source of proteins, vitamins and other essential nutrients. The reason why it earned the reputation of being a junk food is that they can be bought from junk restaurants. 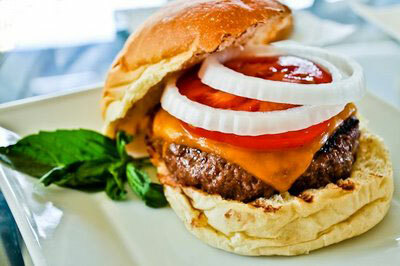 Preparing your hamburger right in your own kitchen is a very easy task and takes a very little amount of time. You can even prepare a hamburger which is a whole lot better than the ones you get from fastfood chains. In a bowl, mix all the ingredients gently. Shape into 4 balls using your hands. Place the skillet under medium heat and put a little amount of oil. Place the burgers on the skillet when it is already hot. Use a spatula to flatten the balls. For medium rare, cook each side for about 3 minutes. If you want it rare, cook for a lesser time. And if you want it well done, cook longer. Toast the insides of the buns using a toaster, grill or broiler just before the burgers are ready. You can spread a little butter on the buns first if you are using a broiler or grill. In serving your burgers you can spread a small amount of mayonnaise on the bottom half of the bun. You can also add a slice of tomato, a lettuce leaf and a slice of raw onion. On the top half of the bread, you can spread a liberal amount of mustard and a dab of ketchup. You can also add whatever you want to your burger. That’s what makes homemade burgers really great to prepare. You can also serve with homemade French fries. To make your hamburger high fiber and low fat, use whole wheat buns instead of your regular bun. Add a good amount of lettuce and cut out the butter and mayonnaise. Cooking your burger using a skillet is the easiest method. But if you want to make your burger low fat, it is best to cook it using a broiler or grill because the fats are dropped to the coals or drained through the grill.